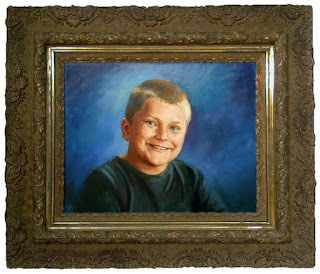 "Portrait of Hayden" is a recent commission that I delivered a couple of weeks ago. Hayden's grandmother was very specific about how she wanted her grandson portrayed. She was a joy to work with and loved the finished portrait. This gorgeous antique frame was what she chose to have the artwork displayed in. I love the blend of the past, present and future.